A few weeks ago, my parents came to visit from the lovely state of Nevada. Even though their stay is just for a week, we are never surprised to see that they’ve brought enough luggage to stay a month. That’s because the luggage are all packed with goodies for us and the kids! Food goodies! Seaweed crackers, special Chinese sausage, lap cheong, that you can only buy from Canada (the brand is called Happy Meat), salted kumquat for sore throat, dried anchovies with peanuts. Mom also used a cooler in her carry on to bring fresh roasted duck and crispy roasted pork from a famous restaurant near her home. That’s the dedication of a loving Mom and true food lover! 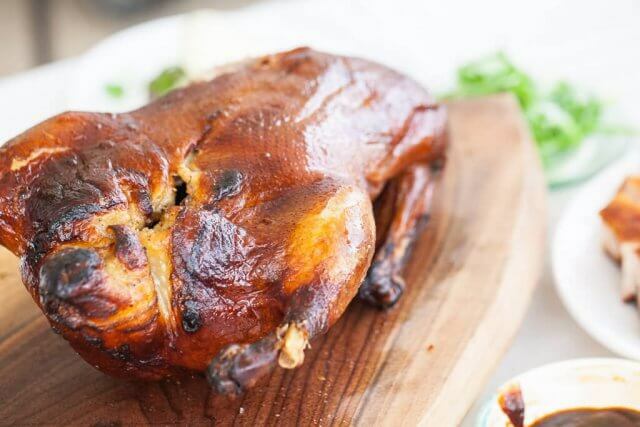 Chinese Roast Duck certainly begs for handmade, freshly steamed buns. 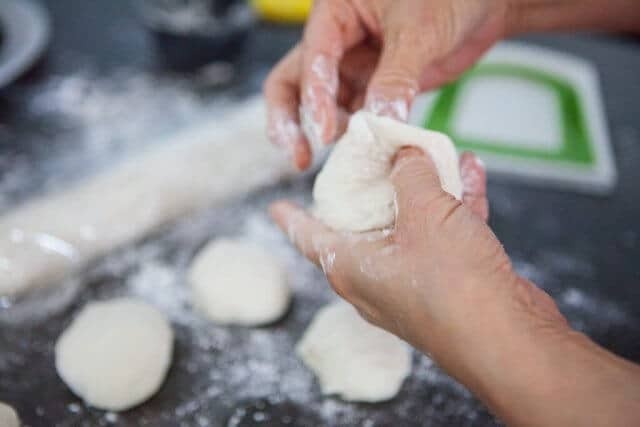 I’ve shared before our little shortcut secret using store-bought sourdough biscuit dough sold in cans, or a pre-mixed flour found in Asian supermarkets. This time, Mom and I made them from scratch, experimenting with a couple of different recipes and declaring this recipe the winner. The first step is to make the dough, mixing in warm water, yeast, sugar and cooking oil. Then flour, baking powder, salt. In the photo below, the dough was sticking to the side of the bowl, we added another tablespoon of flour. 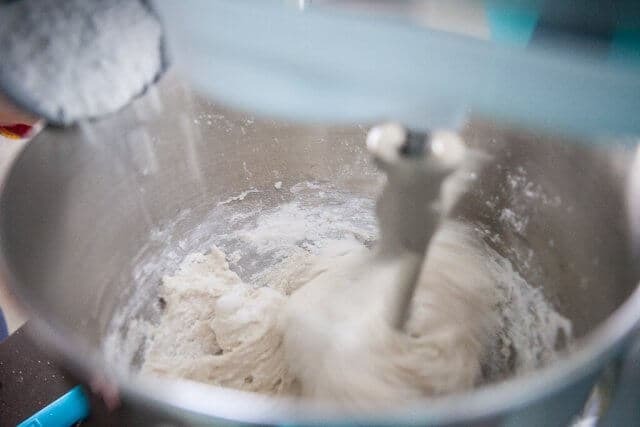 Let your mixer do the work for you, mixing with the paddle first, then switching to the dough hook to knead — or turn out on your counter to knead by hand, which is what my Mom prefers to do. Knead until you get a smooth, supple dough. You can return this dough back in the same mixer bowl. 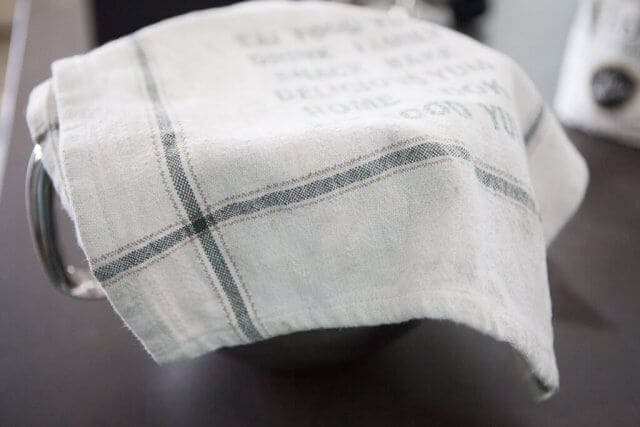 Cover with plastic wrap or a towel and let it rise in a warm spot for 1-2 hours, until it just about doubles in size. 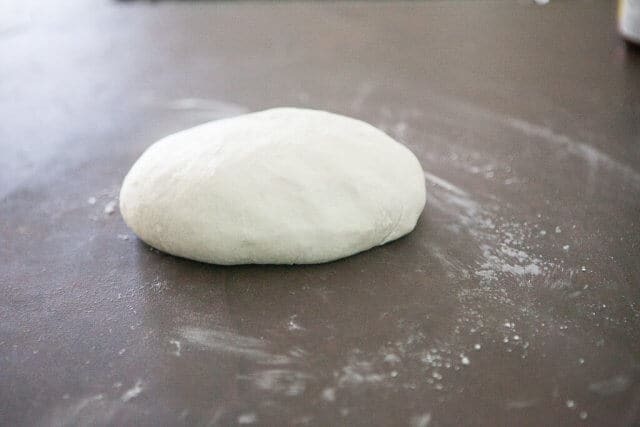 After the rise, gently turn out the dough back on your counter that you’ve lightly dusted with flour. 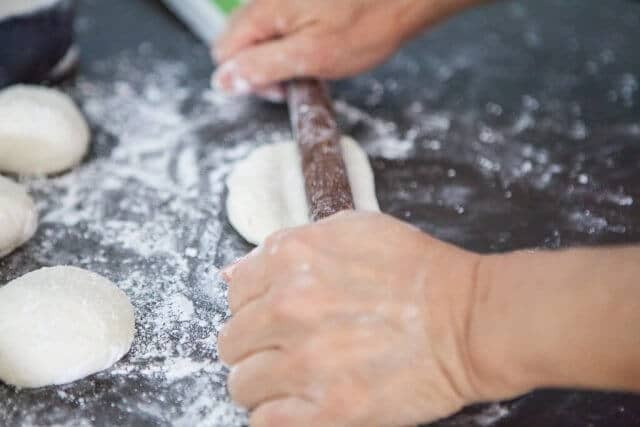 Divide the dough into half, roll out each half into a long log. Cover one log with plastic wrap so that it doesn’t dry out. Further divide the log into 6-7 pieces, depending on how big you want your buns. 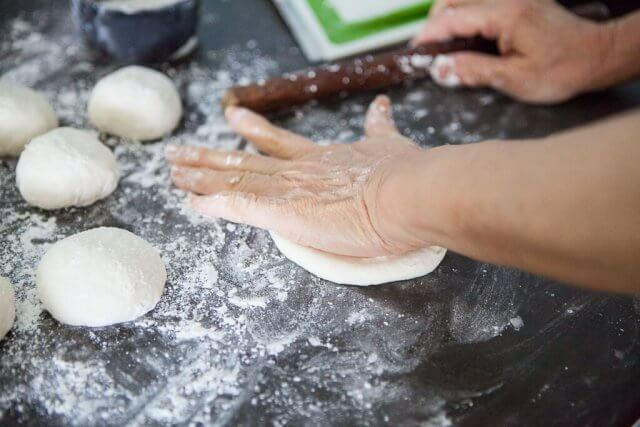 Take one piece of dough into your hand. 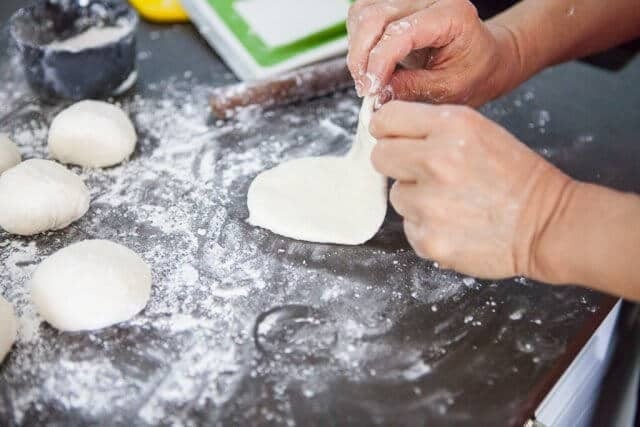 Fold the edge of the dough into the center and press down. Do this all the way around. This motion creates a smooth ball and increases the surface tension to help shape the ball. See how all the edges of the dough have come into the center? Pinch that center to keep all the edges together. Turn the ball over. Now you should have a perfectly smooth, round piece that is nice and taut with surface tension. Use your palm to flatten that ball out. 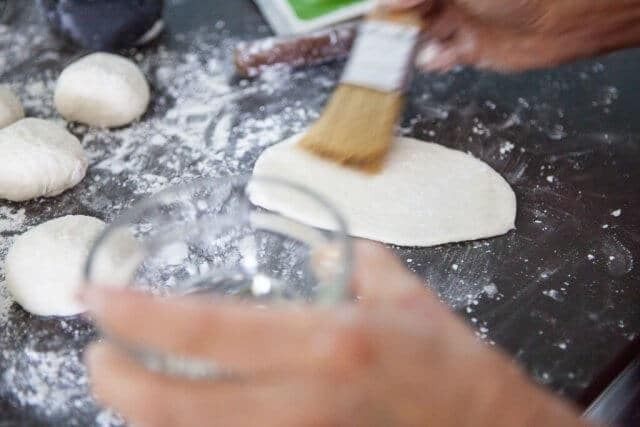 Use a rolling pin to roll back and forth to create an oval. Brush the surface with cooking oil. To create the bun. The cooking oil helps keep that seam, so that when you are ready to eat, you can open the bun. 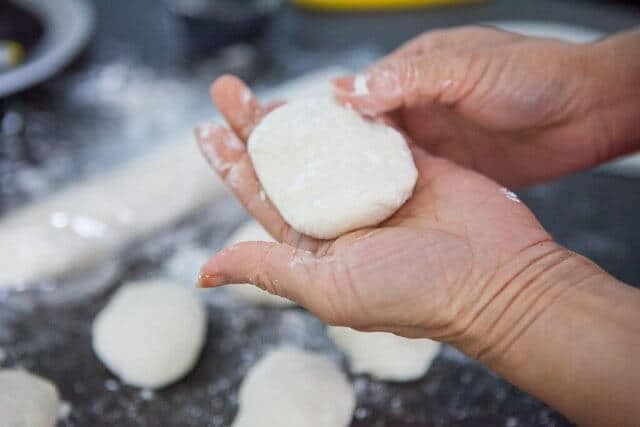 Without the cooking oil, the dough would stick together and be difficult to open the bun. 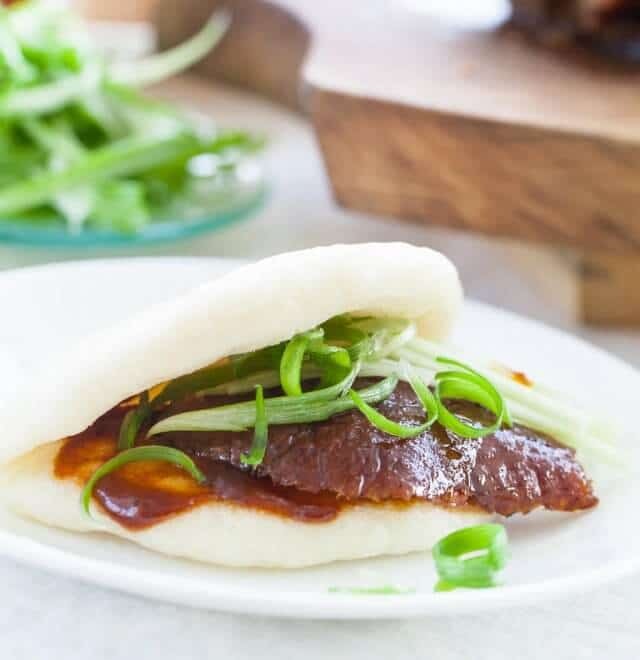 However, if you steam the bun after this step, the bun will open up in the steamer. That’s not what you want. You want the bun to stay closed during cooking. So, what you need to do is roll one more time on top, not too hard, just a little bit of pressure is all that’s needed. 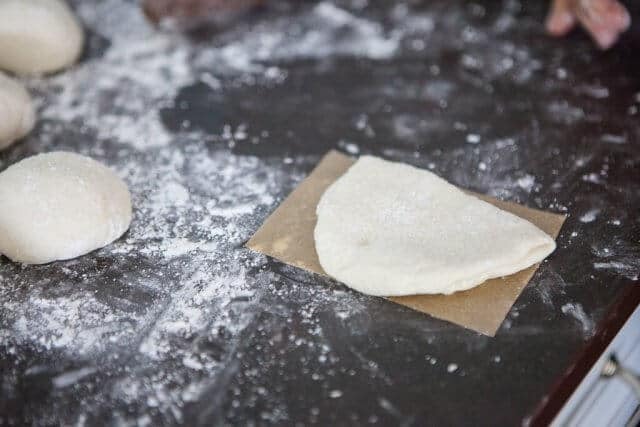 Place bun on a small square of parchment paper. Fill your steamer, but give the buns enough room to expand during cooking without touching. We use 10″ bamboo steamer at our house (I suggest no smaller than 10″). My Mom loves her multi purpose, stainless steel double boiler/steamer set. I used to just set my bamboo steamer directly into my wok, but it would sit so low that I would constantly run out of water during steaming. 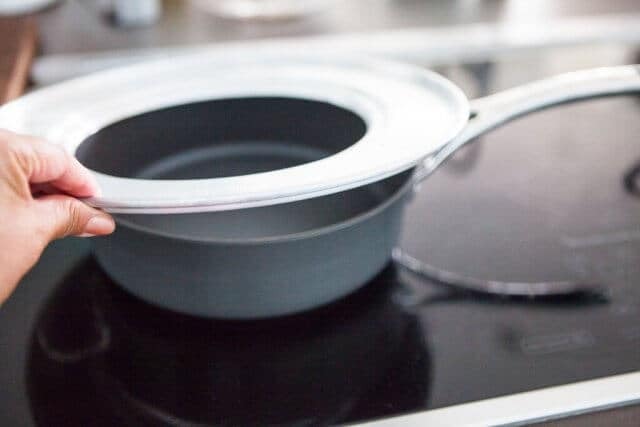 This is a big problem – when you run out of water during steaming, the food will begin to taste burnt and metallic. No water in the wok means no steam…instead, smoke. I began using Helen Chen’s Steaming Ring set on top of any of my large pots. 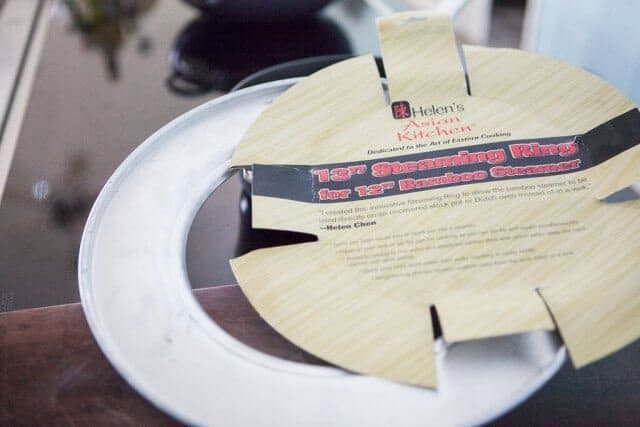 The Steaming Ring is $9.99 and allows you to transform any of your stockpots or dutch ovens to work with a bamboo steamer. It’s definitely worth every penny! Place the ring on top of the pan. Fill pan with about an inch of water. Set your bamboo steamer on top. It works perfectly with a 10″ bamboo steamer. 1. Do not turn on the heat yet. Let the buns rest and rise for 10 minutes, just as-is. 2. After 10 minutes, turn on the heat to high. 3. 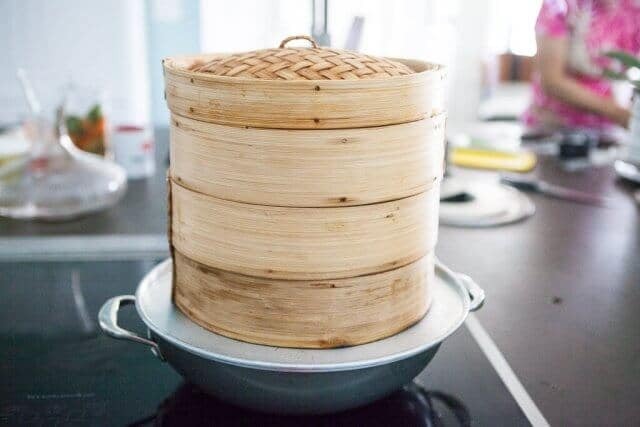 When you begin seeing steam rise from the top of the bamboo steamer, reduce heat to medium-high and set your timer for 5 minutes. 4. After 5 minutes, turn off heat. Do not open steamer – let the buns rest for 1 minute. I’ve made these buns so many times, and each time, the buns would turn out beautiful and perfect, but then would deflate or flatten after cooling. They also would take on a little yellowish tinge and be a bit chewy. The bamboo steamer needs to be in place before the heat is turned on. This allows the buns to heat up and steam gently and slowly, as the water begins to boil. 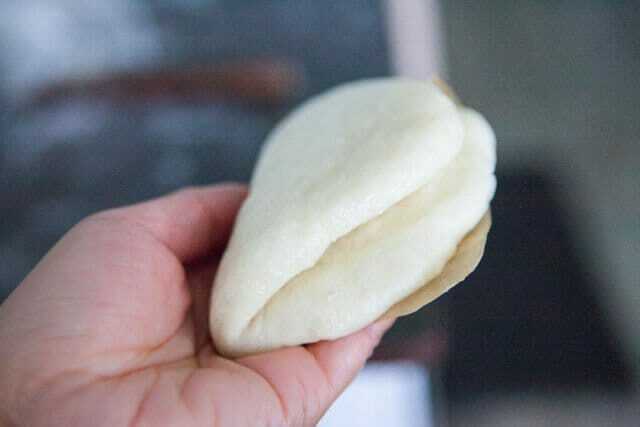 My old method was to wait for the water to boil before placing the bamboo steamer, which caused the buns to cook too quickly, which resulted in a chewier bun. 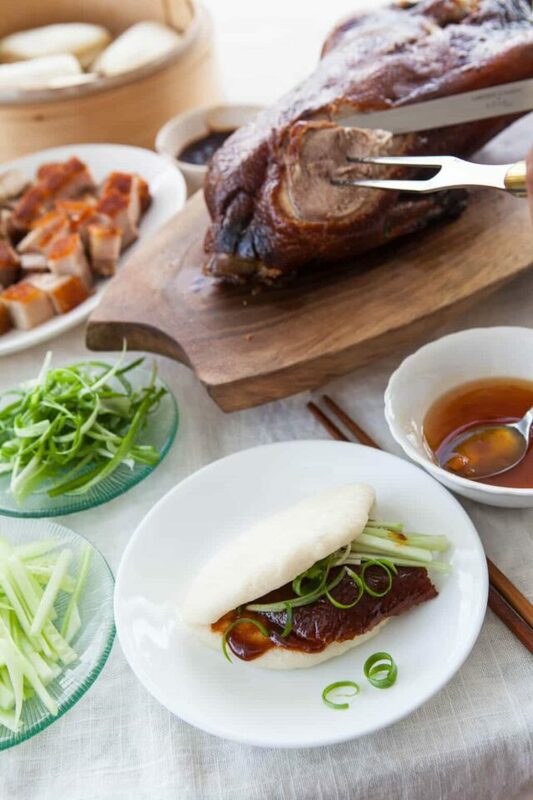 Remember, steamed buns should be delicate and light — and so the cooking method needs to be gentle as well. 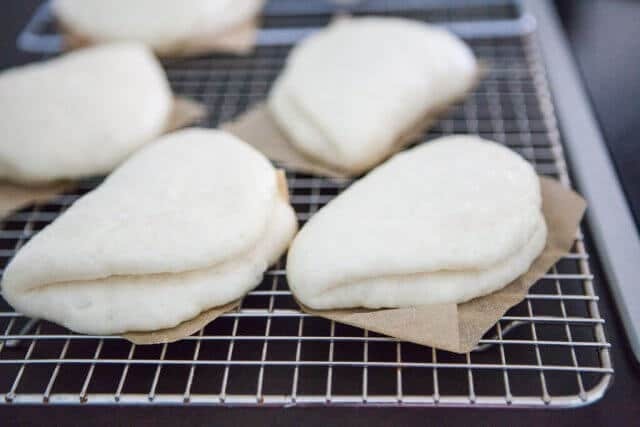 Turning off the heat (step 4 above) but NOT opening the steamer for 1 minute allows the buns to gradually come down in temperature and also lets the buns sit in gentle steam to finish the cooking process. This helps prevent collapsing buns — and keeps the buns nice and white. Take a look at this bun – nice and fluffy. The seam is distinct and easy to open, but stays closed during cooking, which is what you want. 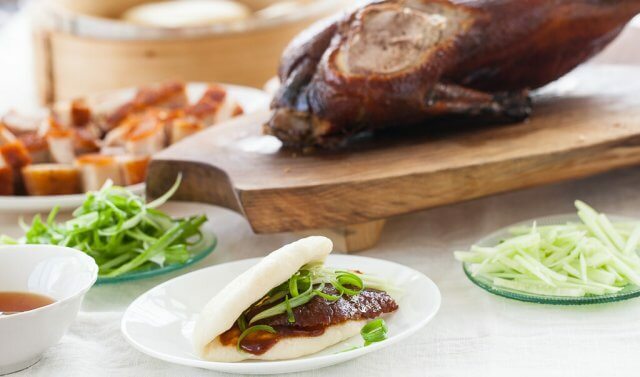 I hope you have a chance to make these Chinese Steamed Buns, the next time you get a Chinese Roasted Duck on your hands (maybe you are lucky enough to have Mom who will bring you one?) 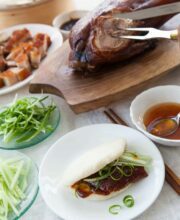 Or you can make your own Chinese Roasted Duck – here’s my easy recipe. 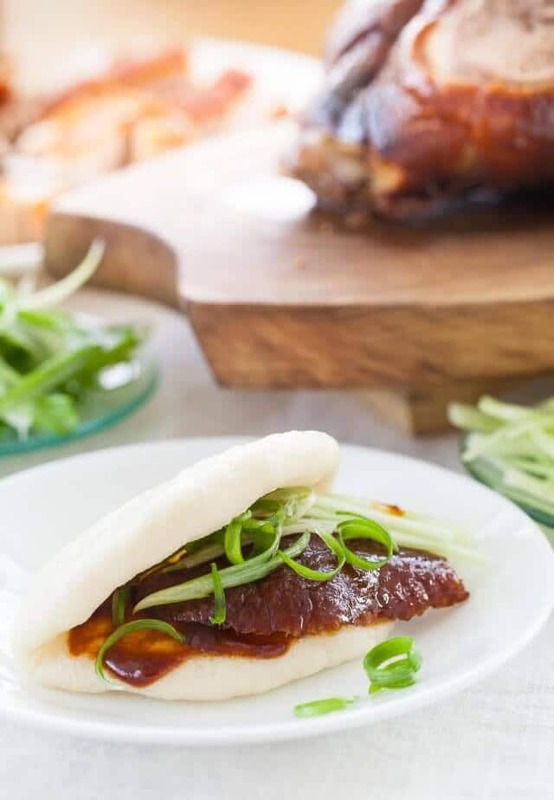 How about Pork Belly with the Chinese Steamed Buns? 2. 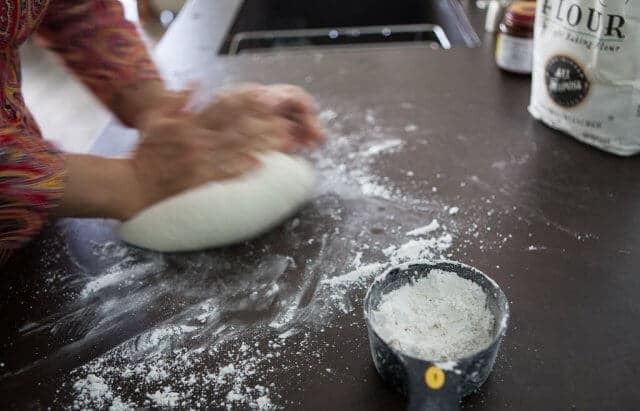 Dust your counter with a little flour and turn out your dough. 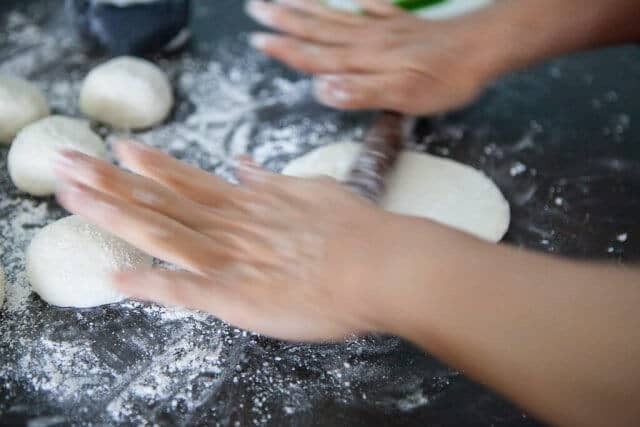 I like to hand knead it a few times, so that I can get a feel for the dough. 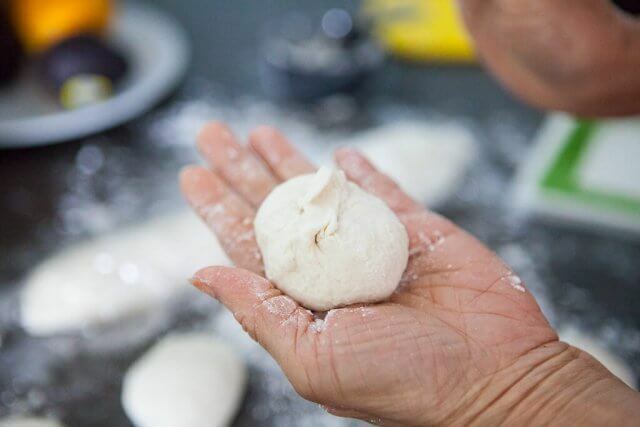 Shape the dough into a smooth ball. 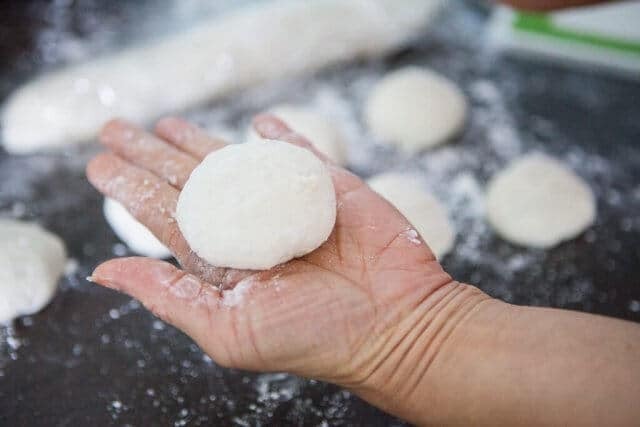 Return the dough ball to the mixing bowl, cover with a clean towel and let rise in a warm, dry spot for 1-2 hours, until it nearly doubles in size. 3. 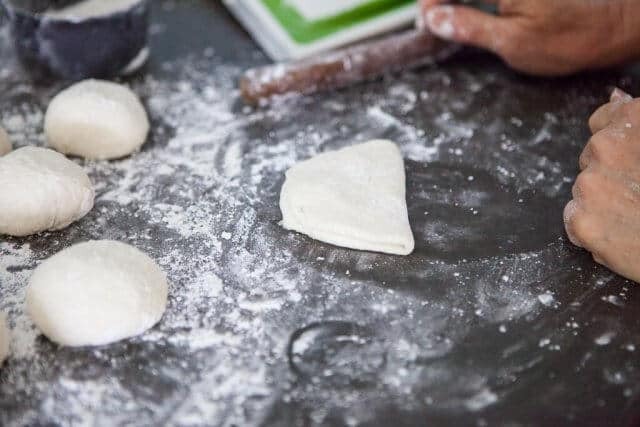 Turn out your dough onto a lightly floured surface. Cut the dough in half. Gently roll each half into a log shape. Cut each log into 6 or 7 little balls. We'll work with one ball at a time, so keep the rest covered with plastic wrap so that they don't dry out. Form each ball by bringing in the sides (see photos above) and pinching the center. Turn ball over to get a nice, taut ball. 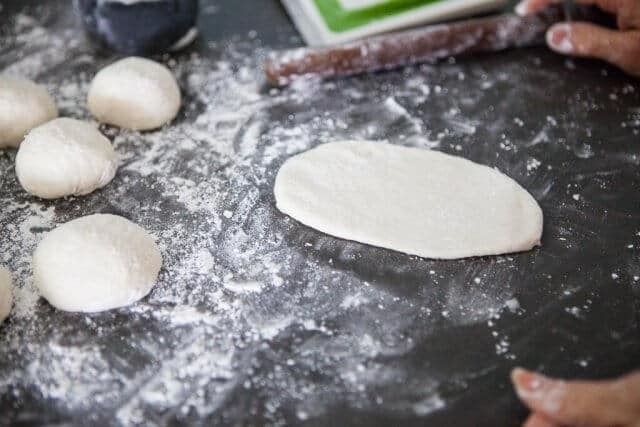 Roll the dough ball out to a long, oval shape about 6"x3". Brush the top with a little cooking oil. Fold over one side of the oval. Use your rolling pin to gently roll and press one last time. 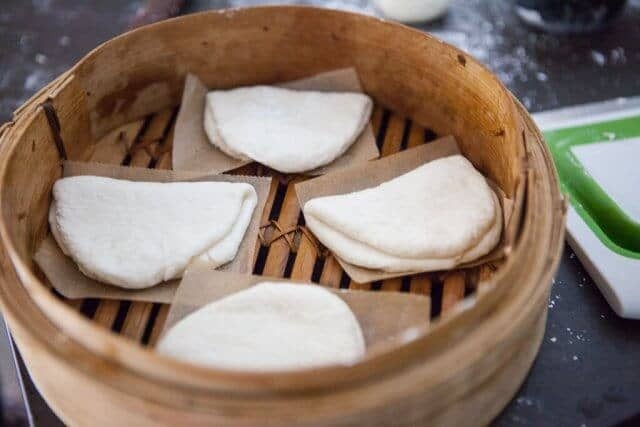 Place bun on a parchment paper square, place into the bamboo steamer and cover with lid to prevent drying. 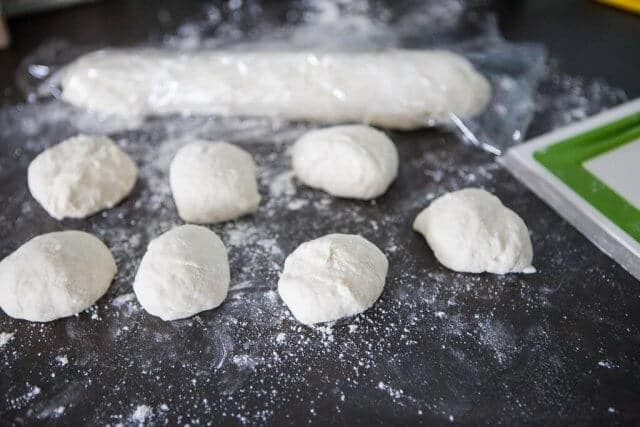 Repeat with the remaining dough balls. 4. Fill your pot or wok with 2" of water. Place the steamer ring (if you have one) bamboo baskets on top. Do not turn on the heat yet. Let rest for 10 minutes. Then, turn on the heat to high. When you begin to see steam coming up from the top of the steamer, reduce heat to medium-high. Let steam for 5 minutes. Turn off the heat, without opening the steamer. Let rest for 1 minute. Open steamer and gently lift the steamer baskets off one another to let the buns cool. 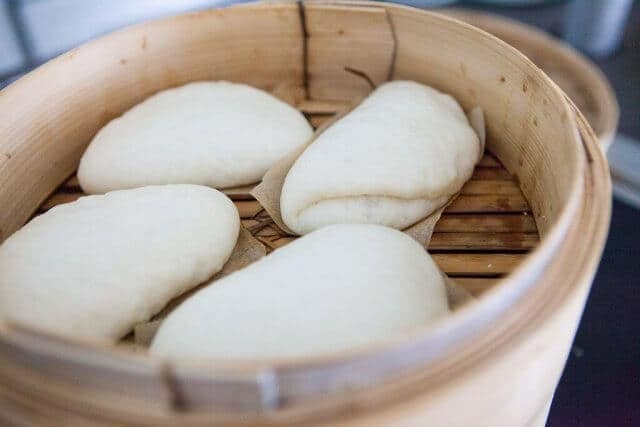 TIP: If you are not eating right away, you can keep the buns in the bamboo steamer, on top of the pot of water. Make sure there is plenty of water in the pot. Turn heat to low, so that you have a gentle mist of steam coming up to keep the buns moist and warm. Make sure you don't run out of water in the pot!